A resource for elderly bathing products, Aging Safely Baths announces temperature control devices for handicap shower stalls and hydrotherapy walk in tubs. These exceptional accessories help regulate the temperature of the water entering the bathing appliance, which can potentially minimize the risk of scalding. Now our handicap showers and walk in tubs can have the option of temperature control valves. A leading supplier of specialty elderly bathing products, Aging Safely Baths announces temperature control devices for wheelchair access showers and hydrotherapy walk in tubs. Both the handicap shower system and the step in bathtubs offered by the company can come with the option of this special safety feature. Bathers can predetermine the desired water temperature. This contraption makes it easier to predict the temperature of the water entering the appliance before someone gets burned. The device is quite simple actually. It mixes the hot and cold water to the desired temperature. The potential downsides to a thermal mixing valve are that the flow of water can be decreased and it can adversely affect the walk in tub fill time. Although in situations where bathers have poor motor skills and lack of sensation in extremities, the potential benefits may outweigh the costs. According to the company, there are several innovative features that may help minimize having a dangerous fall in the bathtub. 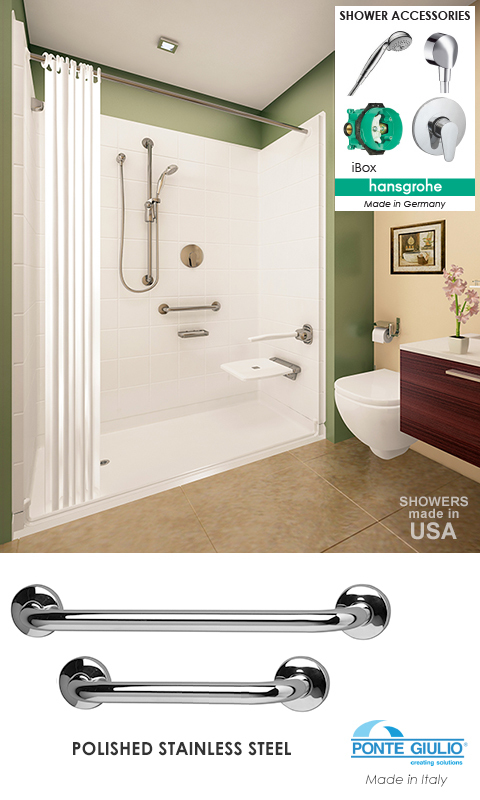 Several of the products come standard with built in safety grab bars, textured flooring and a handheld shower wand. 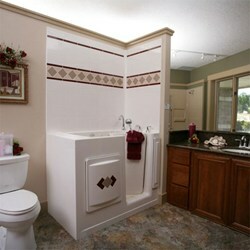 Their premium shower line offers several ADA complaint products, multi-piece showers and one piece shower units. Adding a walk in or roll in appliance might be the right alternative for someone who is considering aging in place options or for a handicapped bather. The low step in entries allow for bathers to enter the shower or tub without having to deal with the obstruction of a tall wall to get over. The company provides a large variety of low threshold showers and tubs that can be utilized for commercial or residential applications. 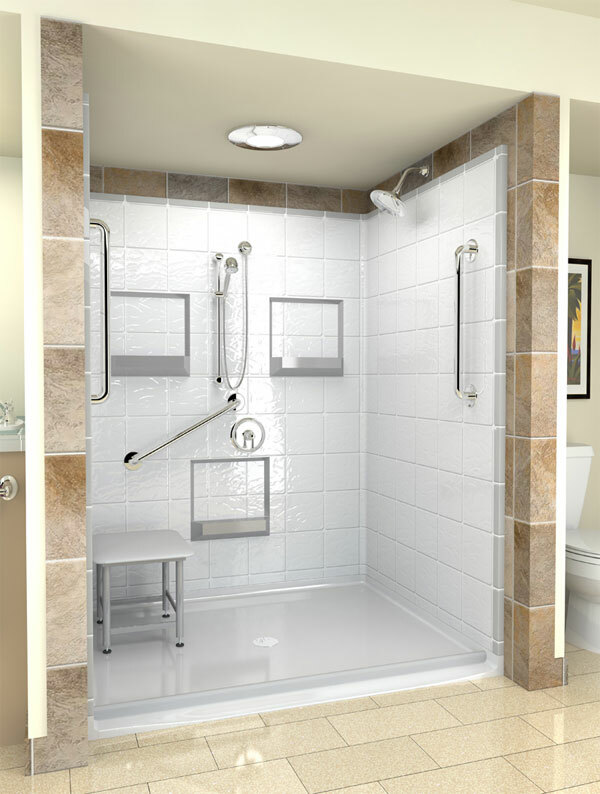 The wheelchair access showers can be installed flush with the bathroom flooring, or have a several inch threshold. Likewise the step in bathing appliances have removable kick plates that make it possible to have a step in of only a few inches. In some applications contractors may be able to install the walk in tub below the sub floor making the step in height negligible. Installing safety features in the bathroom may be one of the more important things to consider when updating for aging in place or making a home handicap accessible. Safety grab bars are commonly installed in areas that may be difficult to maneuver or in places where additional stability is required. In some instances grab bars can be installed directly into the studs surrounding the bathing appliance and near the entry. There are several wonderful technologies that may help with fall prevention. Aging Safely sells several of the top brands on the market, several of which have products that are certified by third parties for quality testing. Finding quality products online can be a challenge, although Aging Safely is a company that’s dedicated to customer service and quality products. Furthermore, they have educated customer care representatives that are available to offer advice and assistance on selecting the appropriate product.